Yes! I found this Terminus Laptop Backpack just in time when I needed a new and durable laptop backpack for my upcoming trip to Japan. Argh... the current laptop backpack that I am using started to worn out especially the zipper get stuck so often. So it’s time to change to a new and better backpack. Terminus is the world's local brand that is well known for its innovative, functional & creative bags. Terminus is a home grown brand that draws its inspiration from all over the world and design-oriented brand that established since 1994. They have produced over 60,000,000 bags for 4000 clients worldwide and with 20 years of experience I am sure that Terminus has mastered the skills of what goes into perfecting the ideal bag for everyone. Well my laptop backpack is very personal to me, especially for bloggers and for those working, when we travel or moving from one place to another we carry our laptop along. So make sure we get a real comfortable, light weight, durable, with the compartments we needed and last but not least look stylish too. Looking for a backpack that able to suit my lifestyle and able to blend into my outfit. I have visited Terminus First Boutique / Retail Shop in 1 Utama Shopping Centre. After going through the different types of bags in the outlet, Terminus bag is not just any ordinary bag. I was amazed by the innovative functions of each bag that caters for different needs, the trendy and colorful designs. 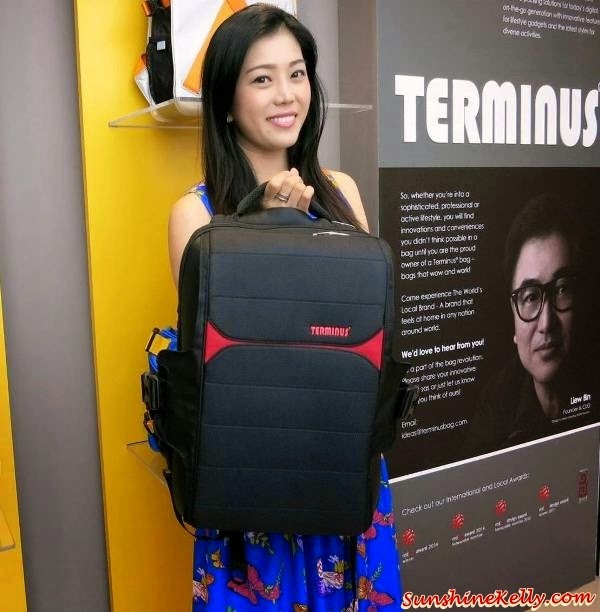 Terminus Laptop Backpack Plus has many compartments that can help me to organize my gadgets, cables, documents, cds and other. It fit up to 14.5 inch. This material very light and robust (it’s about 800g gram). Plus the intelligent of having the slip over trolley luggage handle. It is available in 2 colours; grey and black. I will go for the black because it’s easy to match my outfit and when it’s dirty it not that obvious. I like the simple and clean cut designs with bit of red to add the contrast. Terminus The New Invisible Urban Roller is a thicker size and has more compartments. The front utility compartment with organizer keeps essentials handy. 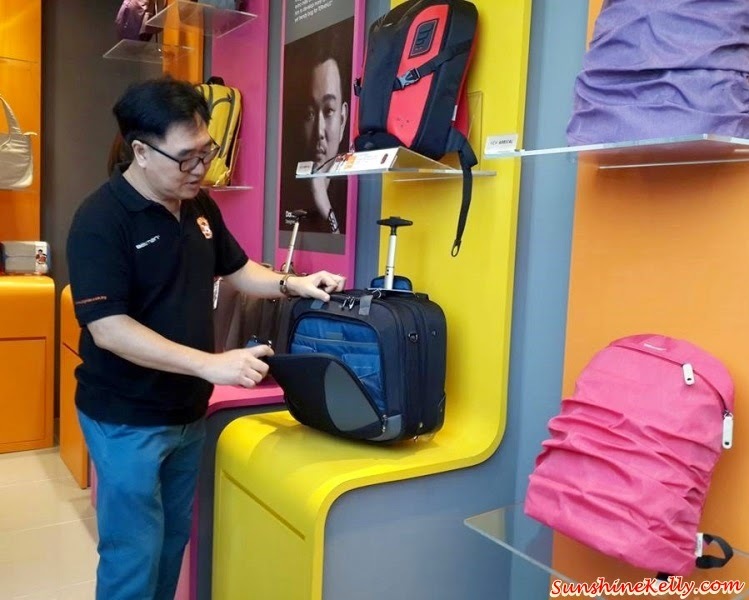 The special thing about backpack is the retractable wheels will pop out when telescopic handle is pulled and close when handle is pushed back. Its available in 2 colours – grey & black. Wow! this Terminus X-Series Backpack is ultra-dynamic. It looks so trendy available in 3 colours – grey, sky blue & black. Inside is quite spacious with the necessary compartment that you need. The material is also quite light. Terminus Bright Tote is very feminine handy tote. It’s available in red, black and white. It has organizer pockets for keys, makeup, bottle, 13" laptop/tablet and mobile phone. The special function about this bright tote is the ultra-bright LED light that is built in to help us to find things quickly in the dark. It has built in magnetic sensor LED, lighted up when unzip the bag. Wow so intelligent! Wish to get this intelligent tote bag also. Terminus is beyond the ordinary, you will find innovations and conveniences you didn’t think possible in a bag until you are the proud owner of a Terminus bag –bags that wow and work for me. They have creative and functional packing solutions for today’s digital, on-the-go generation with innovative features for lifestyle gadgets and the latest styles for diverse activities that caters for everyone needs.